However, the rules set by Ofgem still require the license lite supplier to have arrangements in place with a fully licensed third party, who is able to deal with these codes and action, and who can act on behalf of the license lite supplier to ensure that it is fully operating under the rules of the electricity market. The tender released by the GLA is seeking to establish a relationship with a ‘third party full licensed supplier’ for these services. The key question to this whole process has always been ‘what is the benefit to the third party – who has invested in complying with all these codes and actions – of offering these services to a license lite supplier’? The GLA tender is seeking to address this key issue and see if there is in fact any appetite in the market for a fully licensed supplier to offer these services to what is in effect a potential competitor. Interestingly, the Mayor’s energy advisor, Matthew Pencharz, stated during an evidence session to the London Assembly Environment Committee earlier this week, that two companies have already expressed an interest in the tender to the GLA. Some limited further details are posted on the TfL website here (TfL undertake tender work on behalf of the GLA) – in the PQQ document under section 1.4. “TfL is seeking tenders on behalf of the GLA for the provision of electricity market services as described below. The GLA requires electricity market services to support an application for a GB electricity supply licence by the GLA under proposals of the UK Office of Gas and Electricity Markets Authority of 6th February 2009 entitled – ‘Distributed Energy – Final Proposals and Statutory Notice for Electricity Supply Licence Modification (Ref: 08 / 09). Under Ofgem’s proposals, Ofgem may enable an applicant for an electricity supply licence (in this case the GLA) to be granted a licence without the applicant needing to become a party to the Balancing and Settlement Code and Master Registration Agreement and other codes, providing the licence applicant has presented a realistic implementation plan for robust alternative arrangements with another licensed electricity supplier to provide services, to enable the electricity market to function without the GLA being a party to the relevant codes. Why do all of this? The GLA’s ambition is to purchase decentralised energy systems exported low carbon electricity (mostly from CHP plants in London) and then sell this output to a single consumer – London Underground (one of the biggest electricity users in the UK) – passing more of the value of this purchased electricity back to the generator than is currently the case (estimated at between 10-20 per cent more according the Mayor’s energy advisor), helping improve the business case for more low carbon generation plant in London. Further background to GLA’s work in this area can be found here. The sustainability and energy strategy have informed the building design. Passive design strategies have been adopted and include good orientation, compact building form, low U values, high air tightness, thermal mass, maximizing natural daylight internally, and solar control to southerly facades. Passivhaus utilises passive solar gain and night time purge ventilation in summer, coupled with heat recovery and rigorous thermal and airtightness requirements to greatly reduce energy consumption. An energy statement for the development provides further detail. March 2014: This year’s Green Sky Thinking programme has been announced and, as with previous years, has a selection of really excellent events focussed on sustainability and the built environment. Lots of fascinating subjects covered – below are links to some of the energy-related talks – check the programme linked below for the full week’s activities. All events take place between 28 April – 2 May. 5 March 2014: London Assembly press release calling “on Mayor Boris Johnson to press Whitehall to reverse cuts to programmes designed to reduce energy consumption in the capital. A motion agreed at a today’s Assembly meeting urges the Mayor to lobby the government to rethink reductions to the Energy Company Obligation (ECO) and a two year extension to the time limit for energy companies to fulfil the requirements. The Mayor should also lobby ministers to set out a national infrastructure project that will help to cut fuel bills for 1.2 million London homes by 2015.” Read the news release here. Also today, the government released their consultation on the revised changes to ECO. A City of London case study on the network is available here. March 2014: CIBSE article on CHP and district heating in London “With the Government and planners keen for developers to look at district heating for communal heating schemes, the technology is on the up and up. But size matters with heat networks are are some schemes too small to reap the benefits?” Good article – raising some real concerns over what technical and financial concerns should be considered when pushing district heating – with contributions from the GLA and Islington Council: read the full article here. The RE:NEW programme is awaiting confirmation they they have been successful in their application to the European Investment Bank’s European Local Energy Assistance (ELENA) programme for £2.6m to put in place a support team over a three year period starting from April 2014 (the RE:NEW programme support team is currently operated for the GLA by Capita). RE:NEW is currently working with Greenwich, Havering, Newham and Westminster, Hyde Housing and Peabody Gallions developing “bigger projects that would be more attractive in terms of bringing in Energy Company Obligation (ECO) funding“. Further criticism was targeted at the RE:NEW programme stating that the funding resource was mainly going to Capita : “We see that the resources are actually on those people, basically, for the Capita resource. Local authorities are not really getting the benefit of that on the whole“. An often confusing debate takes place on how many homes were retrofitted through the RE:NEW programme and how many homes were insulated across London in total. A number of 400,000 homes is quoted by the Mayor’s Housing Advisor during the session. Though not explained, this number is most likely made up of the following: 327,00 treated through the Government’s CERT programme over the period April 2008 – December 2012 (see cell V35 of EST CERT data here), and 70,000 homes visited by the RE:NEW team and provided with ‘easy measures’ over the period July 2011-December 2012 (see MQ here for details). For more on this, see earlier post here. RE:NEW Phase 3 has a target of retrofitting 175,000 homes. Just ahead of the evidence session – somewhat belatedly – the Mayor published the full evaluation report of the main RE:NEW roll-out phase which ran from July 2011-May 2012 (a summary report had previously been issued – details here). A second oral evidence session will take place on 26 March, focusing on the Mayor’s decentralised energy programmes, with the Mayor’s energy advisor, Matthew Pencharz, in attendance. Spatial energy masterplan – to identify where and what type of energy infrastructure is required to close the energy gap and provide London with a resilient and competitive energy system. Biodiesel from used cooking oil – to help decarbonise London’s bus fleet by using biodiesel from used cooking oil (UCO) or other waste products. Mayor’s Business Energy Challenge – advice and awards programme to support businesses saving money through improving energy efficiency. The issue of a new ‘spatial energy masterplan’ for London is particularly interesting, and something discussed at in an earlier investment board meeting as part of the GLA’s work on developing the capital’s first Long Term Infrastructure Investment Plan. The newly name DEfLon programme is likely to be a successor to the existing DEPDU support team which itself followed on from DEMaP, highlighting the importance of bringing forward decentralised energy projects in the capital. A second paper presented to the Board provides detail on funding commitments for the Environment team. Amongst these is mention of £10k to continue updating the London Heat Map which also – interestingly – mentions that “The Heat Map has enabled £133m investment in on-site heat networks alone in 2012-13“. The biodiesel report will most likely build on the findings of a study commissioned by the GLA in 2013 ‘The market for biodiesel production from used cooking oils and fats, oils and greases in London‘. February 2014: A new report produced by the UK Green Building Council’s (UKGBC) Zero Carbon Non Domestic Task Group examines the case for action supporting zero carbon non domestic buildings by 2019. 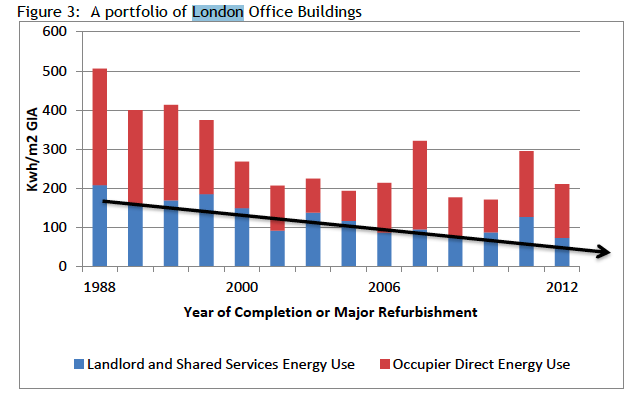 The report includes the following information on energy consumption in London office buildings. 4 March 2014:Welcome announcement today from DECC that the first tranche of funding to local authorities from the Green Deal Communities Fund includes an unspecified amount to “6 north London boroughs led by Haringey“. Following the announcement on 2 December 2013, there is now £80 million of capital funding available under the Fund. Could you warm to a district heating scheme?